SHANGHAI, April 17, 2019 /PRNewswire/ — Arctech Solar, a leading solar tracking and racking system provider, has been ranked No. 1 in the Asia Pacific region and fourth in the global PV market shares among solar PV tracker suppliers in 2018, according to the Global Solar PV Tracker Market Shares and Shipment Trends Report 2019, released by Wood Mackenzie Power & Renewables. 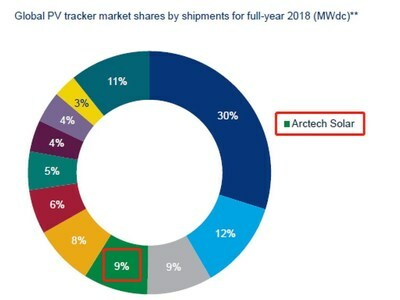 Topping the rankings for the third consecutive year, the report revealed that Arctech Solar captured 9% of the global PV tracker market by megawatts shipped in 2018, growing steadily from 6% in 2017. Besides, Arctech Solar doubled its historical global solar PV tracker shipments compared to last year’s. In addition to its leadership in Asia-Pacific, Arctech Solar has made significant breakthrough in the other regions, for example, ranking third in Australia for the first time. It is also amongst the top 10 vendors in Mexico, Brazil, Spain, Latin America and Europe. Much of the achievements are due to Arctech Solar’s market expanding strategy in these fast-growing solar markets in 2018. Arctech Solar also maintained its lead on the historical total solar PV shipments list (including fixed and tracking shipments) for the third year running with a cumulative record of 18.827GW. This impressive growth comes as a result of the company’s internationalization strategy and its dedication to innovation, execution, and customer service. Launching their global approach in 2013, Arctech Solar’s reach now spans four continents, and the company’s expertise and familiarity with local standards of more than 20 countries enables it to provide customized solutions. As well as expanding its international footprint, Arctech Solar continues to develop breakthrough technologies, including the Skyline new torque tube and the world-leading SkySmart tracking system. These innovations offer higher energy efficiency, reduced installation and maintenance costs, while being reliable and compliant with global certification standards. Specifically, these two tracking systems went through the wind tunnel tests while considering the vortex shedding effect, such as dynamic and aeroelastic instability analysis. Thus, it can help Arctech Solar to safeguard the quality of the tracker system and provide a stable base as a reliable partner for global investors. Arctech plans to showcase its main products at tradeshows around the world in 2019 and beyond as part of its continued mission to bring clean energy to the world. Arctech Solar is one of the world’s leading manufacturers and solution providers of solar tracking and racking systems. In the past decade, Arctech Solar has successfully set up overseas subsidiaries/service centers in the US, India, Japan, Spain, Mexico and Australia. As of the end of 2018, we have cumulatively installed 19GW capacity and completed 900 projects in 24 countries. Now, Arctech Solar is a reliable partner in the global PV tracking and racking industry. For more information, please visit www.arctechsolar.com.